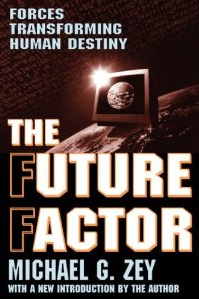 The Future Factor offers an inspiring, optimistic view of the human future. Sociologist Michael G. Zey shows how breathtaking innovations in fields such as biotechnology, computing, robotics, medicine, energy development and space technology are catapulting global society into a new era of abundance and prosperity. As the third millennium begins, technological breakthroughs provide unprecedented opportunities for growth, profitability and organizational and personal reinvention. 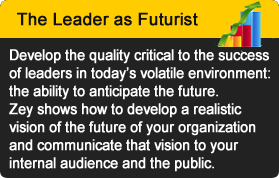 However, to stay ahead of the curve and anticipate future developments before competitors and peers do, leaders, companies and individuals must be equipped with the capacity to make informed decisions. In The Future Factor, Zey provides the sophisticated cutting-edge knowledge needed to achieve competitive advantage that individuals require to make career and life choices. 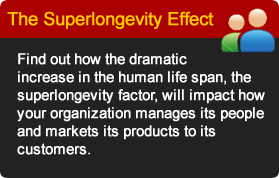 Zey paints a big picture of new forces--biogenesis, cybergenesis, species coalescence and dominionization--that are subtly impacting society and the global economy and changing forever the way we live. Among the subjects explored in this wide-ranging book are: the role cybergenisis will play in making humans healthier; the universal communication network based on the Internet and virtual reality; biogenesis, gene therapy and decoding the human genome; "next generation" robots, smart machines and their impact on economic growth; the colonization of space and the advent of "space tourism"; fusion-based energy and its effect on the environment and global economy; global transportation and a worldwide superhighway; and biotechnological breakthroughs in agriculture and food production. 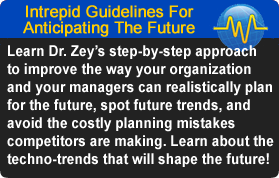 Michael G. Zey, an internationally recognized sociologist and futurist, consults to corporations, government agencies, and universities on future planning. He has appeared on The Wall Street Journal Report, as well as on programs on CNBC, CNN, and CNNfn Business Report, CNBC's America's Vital Signs and The Turning Point. His ideas have appeared in the Wall Street Journal, Forbes, Investor's Business Daily, Worth, Entrepreneur, the Christian Science Monitor, Futurist, and Le Monde. Zey is a professor at Montclair State University and executive director of the Expansionary Institute.